Kea and Leo have known each other since kindergarten. They live in a peaceful--though rather dull at times--suburb. 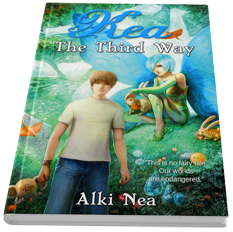 Then one day, Kea changes, and in that instant their lives are turned upside down, as they are thrown into a fast paced adventure that leads them far from their home, into an incredible world. Only then, they realize that our planet, the Earth, is threatened by a massive life extinction similar to the one that wiped out all dinosaurs, 65 million years ago. The Holocene extinction. Only this time, it is us, humans, who are endangering the delicate balance of nature. Kea, bit by bit, uncovers her clouded past, and finally meets her grandfather, but is a relation based on blood stronger than one based on friendship? They say that she has a destiny. They say the future of our worlds is at stake. Kea has become their last hope. They've convinced her that saving worlds comes before her own life. Leo needs to help her. He promised Kea's grandmother he would. Hold on, Kea. Your destiny is in your hands.